This is part of the Pot of Gold Craftivitiy Blog Hop! Make sure to visit all of the blogs to collect all of the freebies. 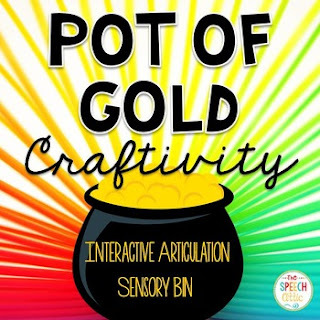 This packet was developed to build a sensory tub with a St. Patrick’s Day theme. Included: 4 pages of coins (print, cut, and laminate) to put into the grass (use a tub filled with Easter grass). Hide the coins in the grass and have your students go on a search for the gold while practicing their speech sounds. *******Included targets: /k/ (20 coins initial/final positions). /g/ (20 coins initial/final positions), /s/ (20 coins initial/final positions), /l/ (20 coins initial/final positions).